As Christians, we want to serve the Lord with excellence. But excellence can mean different things in different situations. At the Olympics excellence means athletes give their all-out best effort to train and excel at their sport. They compete to win. When they finally make it to the Olympics, win or lose, they want to be able to say they gave their absolute best possible performance. Excellence looks a lot different at our church’s Discovery Club. Clubbers can excel at the group games by making everyone in their team feel wanted and accepted. They need to do their part to help their team win or do well. They need to give their enthusiasm to the game to make it fun for everyone. Working too hard to win or showing off in front of other clubbers can actually be counter-productive. A skilled athlete might have to pull back a bit to avoid outclassing the poorer athletes and give them a chance to play. Winning and showing off their skill is not the kind of excellence we need at Discovery Club. In the same way, excellence in a large church may look different than in a small church. A large church may rightfully display excellence when they use their most talented people for an outreach program and give exceptional effort to prepare a polished, professional performance. Less talented performers may be used in less visible programs. Excellence in a small church program may mean using the time, resources, and people you have to the best advantage. It may be a time for the pastor and other church leaders to step aside and showcase other people. Most often smaller churches will have less -polished programs, but they can compensate in other ways to give a good effort that pleases the Lord and reaches out to others. Who is available for choir at this point? How skilled are they? How much practice time can I reasonably expect from them? What kind of music fits the occasion, their skill level, and our finances? How many teens and children are available? What are their skills and interests—puppets, drama, memorised parts? Are they interested in performing and excited to take part or are they shy wall flowers who wilt on stage? Will they work to learn lines? Can I expect their parents to help? Will they make time in their schedules to attend practices? What musicians do I have who can help? What instruments can they play? What is their skill level and how much are they willing to practice? How can I tailor our Christmas program to allow people to shine who don’t usually have an opportunity to be up front? How can I use children and others to reach out to their friends and relatives who don’t usually go to church? If possible, balance less skillful performances with some more-skilled ones. Promote a friendly atmosphere that emphasizes wider participation rather than superior skill. Choose someone who can lead the program in a smooth and friendly manner. Organize seating, music, and platform arrangement to run smoothly from one event to the next. Cover awkward transitions with music or comments from the program leader that draw attention away from movement that distracts. Add some shine with unusual instruments, props, decorations, costumes, or activities. Provide festive refreshments that help this program rise above other activities during the year. 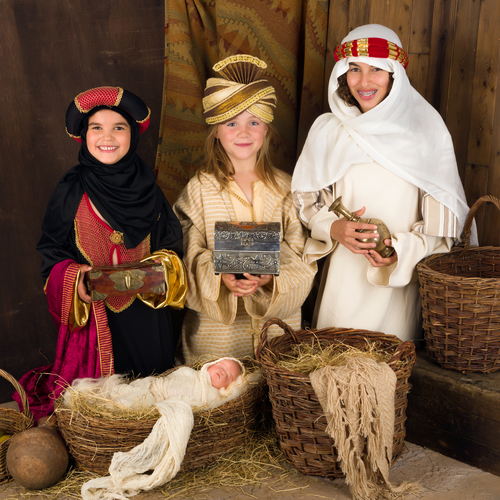 This year you may want to plan an excellent Christmas program and be discouraged with your resources. Remember God sees your heart and knows your need. Simple, friendly, well-planned Christmas programs can be effective in their own ways. I’ve been planning Christmas programs for our mission church for many years. Some years we’ve had many more people and much higher skill and interest levels than others. We’ve had to adapt to our situation just like you have to adapt to yours. You can find 8 original programs here which we’ve used in our church. They offer a variety of performance and practice levels. May the Lord bless your efforts as you look ahead and plan Christ-centered Christmas programs.